Here’s the backstory: Evander Kane wore a tracksuit to a team meeting. Team policy is to wear a suit. Teammate Dustin Byfuglien took said tracksuit and threw it in to the shower. Evander Kane left practice. Social media loves the drama. I think many of us who have participated in team sports have probably been taught the same lesson: you dress up on game day. I had to do it for high school basketball games. To this day, I still have no idea why I had to dress up on game days. I mean I get it…but I don’t get it. Personally, I think as athletes who perform their “job” in athletic wear it seems somewhat incongruous to dress up on the way to the stadium. Shouldn’t you be in active wear ready to warm up? I certainly understand that there is a professionalism argument here: you are here to do a job/represent your school, so look the part! And, I agree that maybe putting on a suit creates a performative aspect that makes game day mentally different from practice day. But let’s face it, most of these guys are in their early 20’s and they get paid to chase, throw, hit an object for an obscene amount of money. They aren’t accountants. They aren’t lawyers. Also, aren’t teams missing out additional advertising space by NOT having teams arrive to the stadium and airport in team logo’d swag? Are women’s teams expected to dress up before games? (Perhaps if there was more coverage of women’s sports I would know the answer to this). What is the real logic other than – that’s how we do. The definition of a thug: a brutal ruffian or assassin. The origin of the word is from Hindi and Urdu meaning thief. As Cherry states “Look, two thugs. Gonna break into your car every time.” This, from the man who’s apparel has become both the joke and the punchline for hockey fans. This, from the man who not too long ago wore a white suit with goal lights all over it. Funny thing is, these Tampa Bay “thugs” were wearing suits (+toque/knit cap). 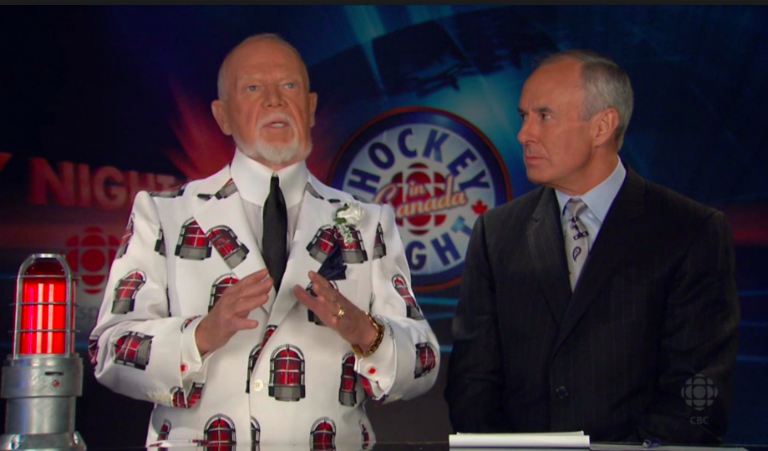 I can only guess what Cherry will say on tonight’s Coach’s Corner about Kane’s tracksuit. We are told not to judge a book by its cover, but at the same time: clothes make the man. In his one minute rant, Cherry equates fashion with playing ability and morality. First class teams dress like professionals, and the last place team dresses like an underclass. He doesn’t say they dress like losers, although that is implied in the four letter word: thug. People who steal and kill have no morals. People who rob and steal have no respect for authority. Consequently, those who dress like “thugs” must also have no respect for the game, their fans, or their coach. How you dress = How you act. Thugs learn that laws are not applied to them as they are to others, so living “outside the manna of the gods,” the hip-hop thug makes his own moral and political laws, borrowing from both acceptable (love-driven and hopeful) and despicable (violent, exploitative, and nihilistic) models of the universe. The suit was created as a British counter argument to exorbitant luxury and ever changing fashions that only the elite could afford. Specifically, the three-piece suit was meant to reflect “thrift, modesty, economy, mixed with gentility, nobility, and politeness” (Kuchta, 2002, p.79), in other words, that Gretzky-an politeness. Maybe Kane was thumbing his nose at team authority, or maybe he really did make a mistake and didn’t have time to change before the meeting, but doesn’t the team dress code seem archaic and somewhat hypocritical when once the suits come off what is revealed is a that game that endorses multi-million dollar contracts, fisticuffs, cursing, and vigilante justice? Hardly modest or gentile, it would seem. Jeffries, M.P. (2011). Thug Life: Race, gender, and the meaning of hip-hop. Chicago, IL: University of Chicago Press. Kuchta, D. (2002). The Three-Piece Suit and Modern Masculinity: England 1550-1850. Berkeley, CA: University of California Press. Wilson, B. (1997). “Good Blacks” and “Bad Blacks”: Media constructions of African-American athletes in Canadian basketball. International Review for the Sociology of Sport, 32(2), 177-189. Not about race, not about what Don Cherry thinks. It is only an kid with a very bad attitude which is toxic to the team.